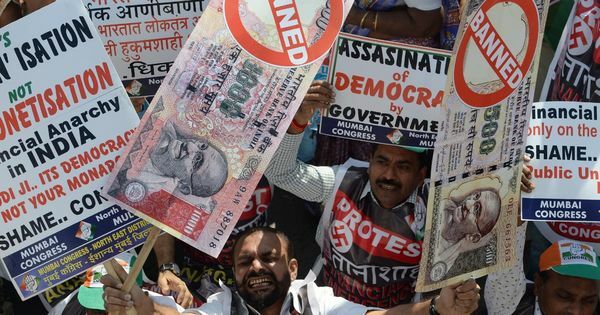 Speculation, hardship and a glimmer of anger in Uttar Pradesh after demonetisation. The bazaars and bastis of Allahabad are rife with rumours of Prime Minister Narendra Modi taking from the rich to give to the poor. Of doctors with rooms full of cash dying of shock and of bags of black money unearthed from businessmen. The city’s businessmen, however, said that “note bandi” – Modi’s decision to withdraw Rs 500 and Rs 1,000 notes from circulation – despite the losses they currently face, is an altogether brilliant move to curb black money, of which they have none. At 8 am on Friday in central Allahabad’s Rajapur “labour chowk”, as it is locally called, daily-wage construction workers milled around. There seemed to be broad consensus that the decision to pull high-value notes out of circulation was a good idea, because it would hurt those with black money. The kala dhan being deposited in banks, said Kamlesh, a mason from Khaga in Fatehpur, would be given to the poor. “There is a yojana, to put Rs 50,000 in all zero-balance accounts [under the Jan Dhan Yojana],” he said. Samay Lal, also a mason added, “not Rs 50,000, it’s Rs 75,000”. The country has faced a massive liquidity crunch since the Rs 500 and Rs 1,000 notes were withdrawn from circulation on November 9. The informal sector, which runs on cash, has in large measure borne the brunt. For daily-wage labourers, this has meant more days without work. Iconic food shops on Loknath Lane in the old town had barely any customers on a Saturday evening. At Matadeen’s gajak shop, where stocks usually run out long before the day ends, the owner said that they now had “only chavanni (25 paise) ka business”. His family, he said with a dry laugh, had been supporters of the Jana Sangh and later, the Bharatiya Janata Party, since his grandfather’s day. The only problem, they said, was that the government had not put enough new currency notes and small denomination notes into the system. In Loknath lane, and on MG Road in the city’s up-market Civil Lines area, all but one shopkeeper this writer spoke to took cash payments from customers for purchases ranging from Rs 60 to a few thousands, and not one was asked for or offered a bill. Using digital would take time, they said, as “Allahabad is not as advanced as Delhi”. A few said they were planning to get “swipe machines”. They explained the government’s decision variously as one that would bring peace in Kashmir, rid the economy of fake notes, finish off black money, keep a lid on their expenses and teach their children the value of money. Business was slow but they expected it would pick up soon. They were not worried, they said, as they did not have any black money. Allahabad’s businessmen big and small (and a few professionals too) like to draw a distinction between their “hard earned money” and the “cash in vaults” that they say only politicians and babus have. The “hard earned money” which has “avoided tax” is not sitting around, but circulating to promote more business, which they say is good for the economy. The increased income from businesses funded in this manner is just “more hard earned money”. A successful city homeopath, who admitted to not taking advantage of the Income Declaration Scheme, a tax amnesty scheme that ended on September 30, said that he was willing to accept he had erred, but insisted he had “earned all my money” and was not willing to be compared to corrupt politicians. Himanshu Kharabanda, the district head of the Uttar Prasesh Udyog Vyapar Sangathan, an association of local traders, whose business is silica sand mining, echoed the views of shopkeepers of Loknath Galli and MG Road. Businesses in general would be hit, perhaps for six or seven months, but the future was bright. Controls on cash were not a problem and he too would dearly love to pay his workers by cheque, in the future. Not everyone painted this rosy picture of a world transformed by businessmen joyfully embracing losses to support the prime minister’s decision. Aggrawal’s own business is down 80%. He has let go of staff as there weren’t sufficient orders to cover their wages, despite the wedding season. He only has a third of the workers he would normally have at this time of year. He said there was immense disquiet within business communities but traders’ associations were riven with divisions – with some wanting to stage a public protest and others unwilling to raise their heads above the parapet. As traditional businessmen take cover, entrepreneurial folk are doing a brisk trade in small denomination notes. “Change sellers” do the rounds of shops as they open in the morning – offering 10s, 50s or 100s at a 10% premium. The rumour mill continues to turn, but the day labourers, vendors and garbage collectors who hope for money in their banks also say that in the three weeks since the prime minister’s announcement, nothing has changed in the world around them – the rich are still rich, and the poor are still poor.